“`UCLA Film and Television Archive and the Hugh M. Hefner Classic American Film Program presents Michael Curtiz: A Life in Film. This retrospective features many iconic motion pictures; and, a series of oral presentations that covers the life and career of the acclaimed director. This airs from tonight to March 17th at the Billy Wilder Theater. “`The Archive is pleased to celebrate the career of Michael Curtiz with a retrospective of some of the director’s most renowned and seldom shown titles, including a pair of rare silent movies, and a couple of movies from his production company that were created at Warner Brothers. Each screening includes Four Daughters, Casablanca, The Adventures of Robin Hood, The Sea Wolf, Romance on the High Seas, 20,000 Years in Sing Sing, Kid Galahad, The Kennel Murder Case, Yankee Doodle Dandy, or Mildred Pierce. 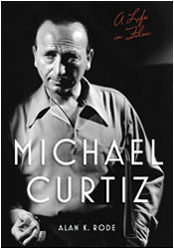 “`In-person will be author Alan K. Rode, who will sign copies of his book, Michael Curtiz: A Life in Film, before each screening (except February 3rd). Curtiz directed over 180 films; 94 of them during more than a quarter-century at Warner Brothers. He was in many ways the anti-auteur, directing tearjerkers, swashbucklers, musicals, melodramas, war epics, historical dramas, westerns, horror flicks, and film noir. This entry was posted on Friday, January 5th, 2018 at 1:53 am	and is filed under Blog by Manny Pacheco. You can follow any comments to this post through the RSS 2.0 feed. Responses are currently closed, but you can trackback from your own site.